Arrow does its best work within the confines of a predictable, almost clockwork universe; so much of what happens on this show occurs because that’s just sort of the way this show works. Case in point: It’s a part of Arrow’s storytelling grammar that any conversation Oliver attempts to have will be interrupted by an ill-timed cellphone call or by the sudden appearance of a concerned Team Arrow member, usually Diggle. Outside of the heart-to-heart chats in the Arrow Cave, you could probably count on one hand the number of conversations Oliver has had this year lasting longer than five lines. Such compression of Oliver’s interactions helps the show streamline its many narratives, wasting no extra time on the non-vigilante subplots, and the brevity of Oliver’s non-superhero conversations helps to reinforce the loneliness of his existence. The show finds the most heartbreaking possible expression of this trope tonight in Oliver’s failed reconciliation with Thea. Never mind the frightfully low odds that both of Oliver’s talks with Thea would be broken up at crucial junctures by Slade’s diabolical schemes. Such fortuitously timed interruptions may be implausible in strictly logical terms, but they work because they so effectively underline the episode’s thematic arguments. 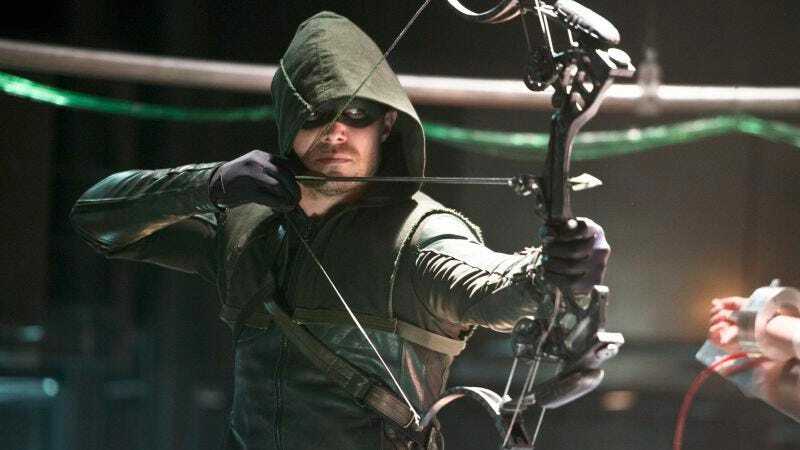 The point is that Arrow is capable of selling its audience on an awful lot of ridiculousness just so long as it ensures such instances feel true to the characters’ journeys and to the larger story. Unfortunately, “The Man Under The Hood” doesn’t acquit itself as well on this front as the other episodes in Arrow’s recent, hugely successful run. This is a frequently awkward episode, punctuated by moments of concentrated awesomeness that feel just a little too calculated in the absence of stronger connecting material. Some of tonight’s clunkiness is an artifact of this episode’s original purpose, namely as the backdoor pilot for next season’s The Flash spin-off. Though Barry Allen won’t wake up until the premiere of his own show, we do meet a couple of the characters—and hear about another, one with the deeply significant name Iris—who will be joining Barry in his upcoming adventures in Central City. Danielle Panabaker and Carlos Valdes do what they can to make Caitlin Snow and Cisco Ramon’s introductory scene, in which the pair cram a planet’s worth of exposition and character hints into a handful of lines, into something that vaguely resembles how humans communicate, but their challenge pales in comparison to Emily Bett Rickards’, who must subsequently make the rather convoluted introductions to Diggle. The show leans on Felicity’s awkwardness to mitigate the scene’s unnatural feeling, but her goofy fumbling can’t hide the basic structural issue here. Again, Arrow exists in a carefully ordered universe, one in which there are really only two kinds of guest stars: the villains and the old friends of the main characters (and yes, there is substantial overlap between those two categories). The introduction of two random S.T.A.R. Labs scientists that we’ve never seen before unbalances the audience’s expectations, as though Arrow is trying to convince us to care about these strangers for reasons that have nothing to do with the show’s core mission. And that, indeed, is precisely what’s going on. Their only moment that really works is when they use Arthur Light’s weapon to temporarily incapacitate Deathstroke, because that’s the one moment the episode shows us these are characters worth paying attention to instead of just telling us. Admittedly, Caitlin and Cisco have relatively small roles here, so it may seem odd that I spend so much time on them. But the problem is that their awkward presence knocks the entire episode off-kilter, making all of Arrow’s normal assortment of minor contrivances feel far more obvious than usual. In fairness to the future Flash characters, the trouble starts before their debut, as Oliver and company rather awkwardly recap the rationale behind the plan to blow up the Queen Consolidated warehouse; you know, the very plan that they all just completed together. Isabel Rochev’s backstory as Robert Queen’s jilted lover—or soulmate, if we choose to believe her story—would probably play as clichéd under the best of circumstances, but the whole explanation feels even more rote than it needs to be, and neither the script nor Summer Glau’s performance can find a way to distinguish Isabel’s story from the countless ones like it that we’ve encountered in similar such stories. Then there’s the scene in which Laurel threatens her boss and gets the charges against her father dropped. Kate Spencer warns her that future battles won’t be this easy, but, seriously: Why was this battle this easy? Surely somebody in Starling City law enforcement wanted Quentin behind bars for a reason—nefarious or well-intentioned, it doesn’t matter—and if Laurel is really so terrifying a lawyer or her case is really so airtight that Spencer would immediately acquiesce, the show really hasn’t sold either. His release appears to come not because it’s the logical end result of what has come before but rather because it’s the right point in Laurel’s story for her to stand up for herself and her loved ones in this way. Arrow is just normally far, far better at disguising these contrivances, to the point that I don’t typically notice them. Honestly, that’s a shame, because “The Man Under The Hood” does a decent job exploring Laurel’s thought processes as she figures out just what to do with the knowledge that Oliver is the Arrow and Sara is the Canary. Plus, Paul Blackthorne gets to show off his Commissioner Gordon bona fides with his big character’s big speech about protecting the Arrow’s secret, drilling down to the reality that the vigilante’s constant sacrifices deserve at least a small measure of sacrifice in return. Laurel’s eventual decision to hug Oliver and leave their secrets where they are is a nice moment for the characters, though I suspect this is far from the last we’ve heard of this particular plotline. That leaves the episode with just its big, shocking moments: the destruction of the Queen Consolidated laboratory, the appearance of Deathstroke in the Arrow Cave, the reveal that Oliver chose not to cure Slade five years ago, the surprise reunion with Roy, and the final, Mirakuru-aided resurrection of Isabel. The pre-credits sequence is just the kind of bold action that defines Arrow at its best; I’m rather more agnostic on Slade’s surprise appearance, as his ability to do seemingly anything is both impressive and potentially uncontrollable. There’s a point in which it becomes nonsensical to think that Team Arrow could ever defeat one so powerful and so well-informed. The fight in the lair isn’t that point, but it edges us closer than is perhaps absolutely wise. Meanwhile, Oliver’s admission and Roy’s reappearance don’t land as well as they might otherwise. These both should be big moments, but the former feels like the latest shocking reveal for a flashback story that is already plenty tangled, while the latter plays as another instance of the episode going for the big shock because it can’t quite get the right handle on the substance of its story. Is “The Man Under The Hood” really the weakest episode of this season? Irrespective of the grade, I’m not sure I’d go that far; I still probably like this one more than, say, “Broken Dolls.” There’s plenty of good elements here, and this is the sort of slight hiccup that one occasionally finds with serialized storytelling; I suspect the flaws of this episode wouldn’t so obviously register if one were watching it as part of a concentrated marathon, for instance. If nothing else, this episode doesn’t waste the audience’s time, as all the characters’ journeys keep moving forward. Arrow just isn’t able to tell this particular chapter of the story as artfully as it has elsewhere, but there’s no reason to think “The Man Under The Hood” is anything more than that one episode that just happens to slip from the creative team’s grasp. I really liked Thea’s big monologue about how she briefly thought that her life might be even a little bit okay, and how the revelation of her true parentage has destroyed that forever. Considering how long it took Arrow in general and Willa Holland in particular to find Thea, I continue to be impressed just how much of a strength she has become for the show. More than anyone else on the show, Thea knows exactly who she wants to be and who she wants to be with, and that gives her a strength that so often eludes the others; she makes mistakes like everyone else, but it’s particularly heartbreaking when the universe rips her life apart yet again. Her decision to just walk away from Oliver as he takes yet another cryptic phone call felt like an important moment in her development, even as it drove a further wedge between the siblings. The island flashback sees the end of Dylan Neal’s work as Professor Ivo, as the mad scientist bargains vital information for a quick death. 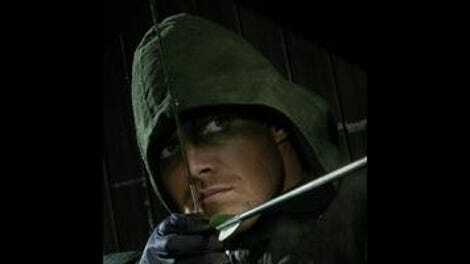 It’s a bit of an ignominious end, but Stephen Amell does some nice, haunted work as Oliver takes the gun from a shaking Sara and then does the deed himself. We’re getting closer and closer to the Oliver of the present day, or more specifically the Oliver of the first season. In the midst of all this, Oliver and Moira seem to, if not exactly reconcile, at least find another moment’s small understanding. Maybe there is something to be said for getting even the biggest secrets out in the open, as their relationship really does appear to be healing now that Thea knows the truth.